A new journal of pain has been published: The Scandinavian Journal of Pain, published by Elsevier, and contents lists available at ScienceDirect. One of the papers I flicked through today caught my eye – and it reminds me that although there is a huge amount of new information about chronic pain available now, many of the concepts are not really all that new. Stephen Butler, a well-respected researcher and clinician in the chronic pain world, writes about his experiences learning from two of the great ‘pain pioneers’, JJ Bonica and W Fordyce. Dr John Bonica was the editor and author of the monumental ‘The Management of Pain’, which has evolved into ‘The Textbook of Pain’, he was also the founder of the International Association for the Study of Pain (IASP) in 1973 – along with around 100 researchers and clinicians, including Christchurch’s own Dr Barrie Tait. John Bonica also established one of the first authors to ‘insist’ on multidisciplinary pain evaluation and management, setting the scene for this approach to be the standard around the world. Bill Fordyce is another pioneer in pain management – he was one of the first ‘champions’ of the application of behavioural principles to the treatment of chronic pain, and indeed incorporated these principles within the multidisciplinary pain management programmes and like John Bonica, his approaches have been and still are being used around the world. His major mark was in applying the biopsychosocial model as an explanation for disability and suffering in chronic pain. Both of these men worked in the mid- to late- 1970’s and beyond – and what they had to offer people with chronic pain was revolutionary. At that time the prevailing models for managing pain could be separated into ‘mind’ (ie psychiatric) and ‘body’ (ie medical) – and never the twain should meet. A question to ponder today is whether this revolution has accomplished all it needs to yet. Stephen Butler was introduced to John Bonica in 1973, on the end of a phone call at 0300, according to this article. From all account, John Bonica was a larger than life driving force who lived, ate and breathed work, particularly pain management. Bonica’s dictum was to evaluate patients with ‘at least three blocks for diagnosis’. I can hear some medics of my acquaintance rubbing their hands with glee at this! Yes, one block was placebo, one short-acting, and one long-acting. Then to move to ‘consider a series of blocks that were diagnostic, prognostic or therapeutic’. At the same time, Bonica emphasised the need for pain physicians to be physicians – to consider the whole person, to read all their medical history, but not to ‘take for granted that it is factual or complete’. Bonica was aware that the results from diagnostic blocks were ‘confusing’ (have things changed any?). So he ‘assembled a group of experts from several fields to work with him’, meeting once a week after they had all seen the person, and discussing as a team, diagnosis and management. This team included people from several medical specialties, as well as psychology, nursing, social work and others. Part of the philosophy was for junior members of staff to learn from these discussions: an amazing experience! I can recall a similar situation happening for me at Burwood in the mid-1990’s, when the whole team was brought together to discuss (on a level playing field, no hierarchies!) 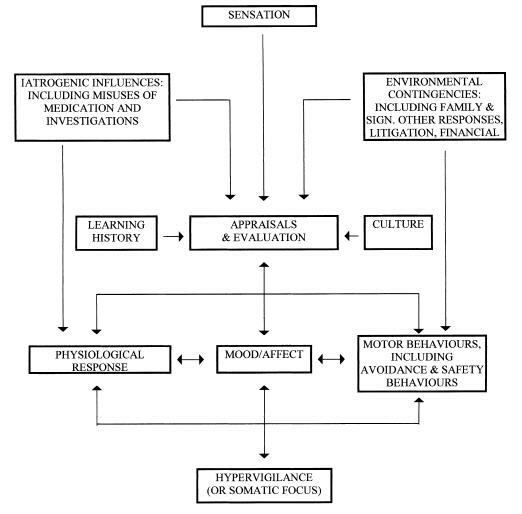 the management of individual patients. Butler goes on to describe his time with Bill Fordyce, who was a very different character from Bonica, but no less significant in impact. Fordyce worked with Butler who found the psychological insights from Fordyce enhanced his practice and especially the ‘common sense’ approach to managing pain behaviours. Butler went on to work on the pain management programme (a three week in-patient one) for the next 15 years! John Bonica taught that you need to take time and listen to pain patients; you need to do a very careful examination…as part of a more comprehensive general examination; you need to have as much information from past evaluations as possible, especially testing; you need to discuss with the patients all the findings, discussing what is not present as well as what is present is important. And the final learning that Butler says he got from both John Bonica and Bill Fordyce is ‘treat the patient, not the diagnosis’. This is south-west of Gore, and I don’t know how old it is, but it’s great example of the cob cottage, built from stone and earth in a simple and timeless design. I think it would have been warm, but not very light inside – and given the winters in Southland, those chimneys would have been well-used. Don’t you wish the women of that time could have left us some more about their lives and dreams? What would it have been like to leave everything to come out to New Zealand? All the comforts of home left behind to start a new life in a brand new country? And what a country! Nothing like the safe haven of the UK, a much harsher place with none of the history of the Old World. But wow – what a place to live! Am I patriotic? I think I am – I’ve never really waved a flag or been especially fervent about the flag or the national anthem, but I love the landscape. I belong in this landscape, it’s something visceral to me. The Maori have a tradition where, when they introduce themselves, they name the mountain, river and area of their birth. I was born in Auckland, but I grew up in Gisborne. I’ve chosen to live in Christchurch, and it’s the South Island that calls to my soul. The hills around Gisborne are limestone and greywacke – they slip at the first sign of rain. The mountains around the South Island tower with huge boulders that are buried in the hillsides and strewn across riverbeds and seascapes. The river I grew up with is the Turanganui – it’s the shortest charted river in the world. It’s the confluence of Taruheru and Waimata rivers, and flows out to Poverty Bay. The rivers I live by now are the massive braided rivers of the Waimakariri and the Rakaia. And of course the Avon. And the mountains? Hikurangi is the mountain I grew up with – first mountain to see the sun every day. Now for me I love the Kaikoura mountains. Wonderful to view, not so nice to climb! And if you live in New Zealand, you’re never, ever far away from the sea. Tangaroa, son of Rangi and Papa, (Sky and Earth). Restless, mysterious, and never ever satisfied. Wherever I live I hope I’m close to the sea, my real lover! Now it’s time to turn to the details of the biopsychosocial model as it is applied to pain. There are some excellent resources available to look at this in both a simple way, and in much greater detail. This site is written by a physiotherapist – and contains some well-written and reasonably simple information both about pain and more especially about low back pain. 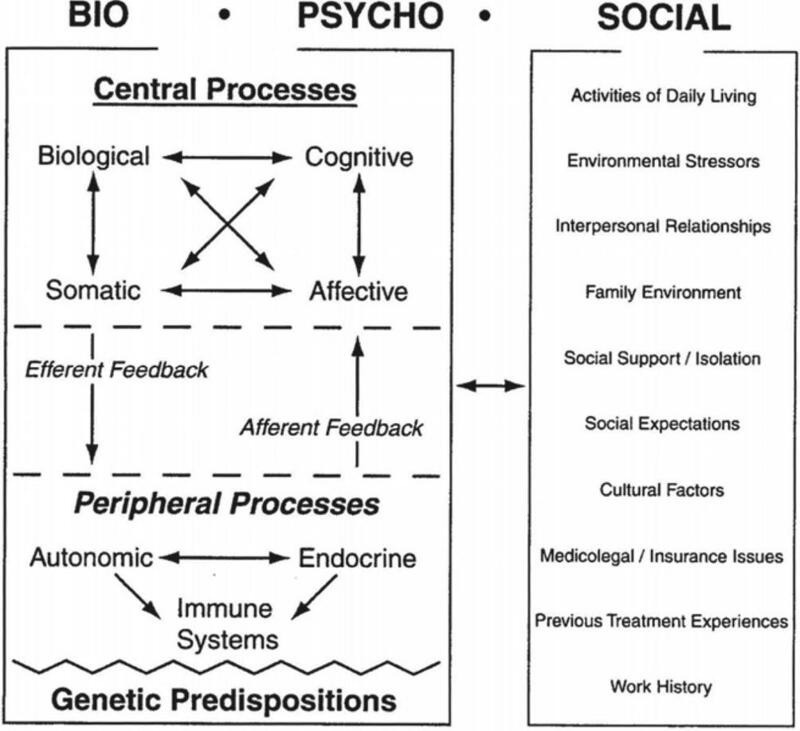 I’d suggest heading to this page on biopsychosocial model for a quick overview. Pain is no longer considered exclusively either as a neurophysiological or a psychological phenomenon. Such a rigid dichotomy is obsolete, because pain is now recognised as the compound result of physiopsychological processes whose complexity is almost beyond comprehension.